One of the weekly highlights in our team, all year round, is our Tuesday prayer evenings. This is something we take very seriously, praying not only for our own ministries and country where we work, but also interceding for other countries and world needs and issues. We take turns preparing the program for our prayer evenings and each group tries to be creative in how we spend our four hours of prayer together. Last week Michaela and Kate hosted the 'World Report' and brought news and information and even an interview with Austin, one of our short-term participants. After each 'news segment' we prayed for the needs that had been identified. One of the main things that we have been praying for over the past few weeks has been our Global Challenge program. 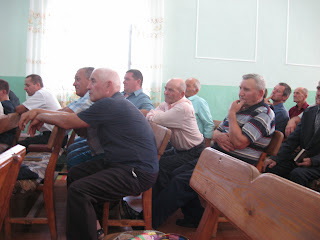 Short term missioners have come to be with us for usually 2 weeks at a time and we are sending out teams to the many villages of Moldova where they will run children's programs, bring food parcels and visit the elderly, participate in sports outreach events, and worship together with the local church. This summer we are excited to have several families participate and on Friday I went to visit a team where a Dutch family is involved. These friends drove from Holland with their three daughters to be involved in our summer outreaches. They want their children to know that they have something to offer the Lord and that many people do not live such easy lives as those in the west. On Friday I went to visit the team that was working in a nearby village and it was great to see this enthusiastic family teaching a Dutch song to the Moldovan children who were attending. On Sunday I had the joy of visiting another church where a group doing sports ministry are visiting and preparing to reach the village with sports activities. The team had a small presentation to make in front of the church. Then there was a presentation by Viorica, on furlough from Angola, about her work in Africa. Then Justin, one of our team members, brought the message. This also happened to be at the church where our team member Eugen is from. And it also happened to be on the day when Eugen and Dana were having their engagement officially announced in the church. I was really delighted to be able to be there for all this involvement on the part of our team but more than anything for the celebration of this dear couple' commitment to one another. Dana is a very good friend so I am just thrilled for her. She and Eugen have both made a very good choice here. 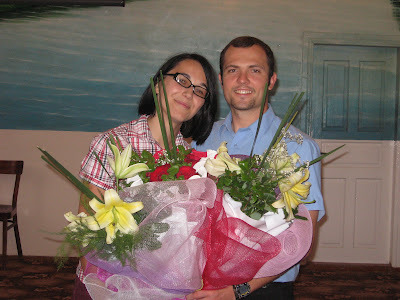 After the service in that church, and sharing lunch with the team, Viorica and I went on to another church not far away. 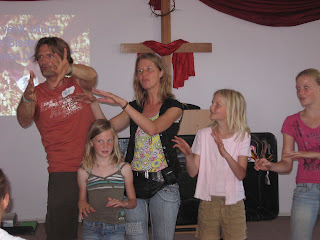 This was the first time I had been at either of these churches and we also have team members from the other church. 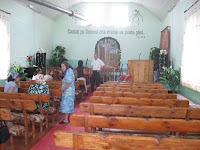 It seems that the Lord has really been at work in this church and despite their not having a pastor, the number of believers is growing rapidly. Our team member, Andrei, came back from visiting home last week to tell us that his mother had accepted Christ. When I arrived at the church I was really surprised to see how full it was on a Sunday evening. One of the women greeted me especially warmly and it turned out that she had attended one of our conferences for day centre workers, where I had been the Bible study leader. The young people filled the first few rows - and did a music program to begin with and then Viorica made her Angola presentation. The church listened attentively and again I was surprised by the fact that the men's side of the church was as full as the women's side! I love this photo of the men listening with so much interest to what Viorica was telling them about Angola and her ministry there. She will benefit greatly from the prayers of this church, I am sure. After the worship service, my friend from the day centre conference invited me across the street to see their new day centre. Here several women from the church feed 20 children every day of the school year and provide them with care and Bible teaching as well. These same women also fed us that evening and we were blessed by their hospitality. The church is waiting in anticipation for one of our summer teams to come in a few weeks' time as the team will be building a playground for the day centre. It was exciting to see how our mission's partnership with this church over the years is bearing fruit. Not only is there meaningful care and ministry for children but the church is growing in number and spiritually as well. 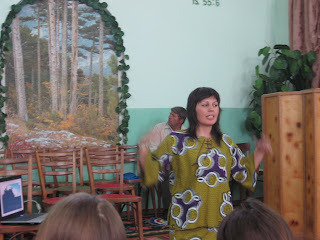 What a special day I had seeing the things the Lord is doing in Moldova! Posted by Barb at 10:30 a.m.